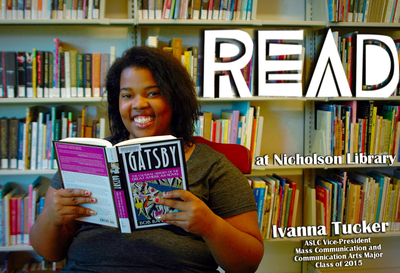 Ivanna Tucker, Linfield student and ASLC Vice-President, class of 2015, reading Gatsby: The Cultural History of the Great American Novel, by Bob Batchelor. Terry, Paula and Nicholson Library Staff, "Ivanna Tucker READ Poster" (2014). READ Poster Gallery. Image. Submission 135.